Could you imagine being involved in a transfer from one club to another in today's football and then having to wait almost seven years to make your first team debut? The likelihood is you would have moved on long ago but going back almost half a century it was very much different. 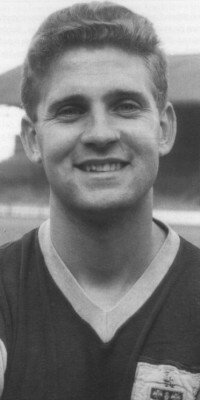 Billy Marshall, a left back, signed for Burnley from Northern Irish club Distillery in August 1953. He'd come over on trial initially and impressed enough to win a professional contract at Turf Moor. Harold Mather, who had been in the team almost throughout since the resumption of league football in 1946, was still wearing the number 3 shirt in the first team but soon his place went to Doug Winton. It was a patient wait for Marshall who then saw David Smith, naturally a right back, played on the left. He was very much the reserve in waiting until we again looked across the Irish Sea in 1959 to sign another teenage left back in Alex Elder from Glentoran. Tommy Cummings started the Championship season at left back but Elder got an early chance and took it leaving Marshall still in the reserves. He finally did get his chance in April 1960 when Elder reported back from international duty with Northern Ireland with an injury. The debut came in a 1-0 win at Nottingham Forest with Ray Pointer getting the goal. Elder was fit for the next game and Marshall dropped back into the reserves but can claim, at least, to have played in a Championship winning team, one of just eighteen players to be used that season. The following season saw him twice deputise for Elder and twice come in for John Angus at right back. He also played in three League Cup games in the competition's inaugural season. There was to be one more appearance in the 1960/61 season which proved to be Marshall's last first team game for Burnley. Just eleven months after his debut he was one of ten team changes for a home game against Chelsea. It cost Burnley a fine of 1,000 Guineas for fielding an under strength team although the reserve team did win a point in a 4-4 draw against Chelsea. A year later, with no more first team games, he decided to move on, but he went with three medals. He captained the reserve team that won the Lancashire Senior Cup in both 1959/60 and 1961/62 and in the second of those seasons we were also Central League Champions. The 1962 Senior Cup win against Liverpool was his last game for Burnley at any level. To add to that he twice played for the Northern Ireland 'B' team in games but never won a full international cap. He signed for Oldham, then in the Fourth Division, and helped them to promotion at the end of his first season. He spent two years at Boundary Park before moving to Hartlepool where he enjoyed a further two years before hanging up his boots. He made 57 league appearances for both clubs. He was one of a number of players who, whilst being more than good enough to have played First Division football, found himself waiting in the wings at one of the top clubs with some outstanding players, leading to his lack of appearances at Burnley. Many years later, in 1991 to be precise, I went for a job interview. The interviewer, noting I was from Burnley, asked if I watched the local football team and if I knew of Jimmy McIlroy and Billy Marshall. He told me that McIlroy had been his idol in Northern Ireland football and said that he'd been a school pal of Marshall. I'm sure my knowing of them helped me get the job. Billy Marshall sadly passed away after a short illness on 20th April 2007 in Hartlepool at the age of 71.